Carlie Gonzalez, 15, who has Ewing’s sarcoma, reacted to the reflexology being performed on her feet. Massage therapist Maria Barbara “Bambi’’ Mathay roamed the pediatric clinic at Dana-Farber Cancer Institute, looking for takers. 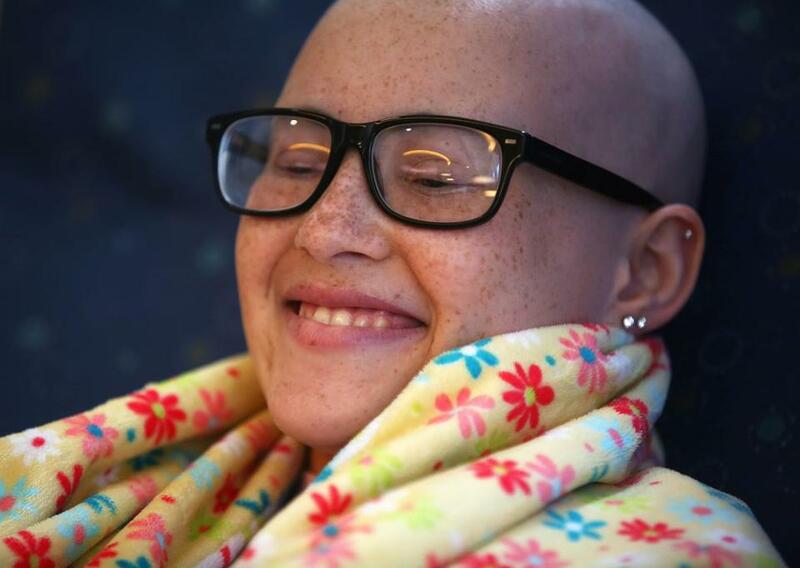 It wasn’t long before she spotted Carlie Gonzalez, 15, wrapped in a yellow blanket and weary from seven months of chemotherapy. Carlie was playing freshman volleyball at Milford High School last fall when an ache in her collarbone became intolerable. A CT scan revealed an aggressive bone cancer that required surgery and potent anticancer drugs that make Carlie nauseated. As the liquid dripped into her arm, Carlie rolled up a pant leg for a session of foot reflexology. “It kind of takes your mind off your stomach,’’ she said. While Mathay gently pressed on her toes, Carlie sleepily closed her eyes. Dana-Farber is embarking on its largest expansion yet of unconventional therapies. Over the past year, it has taken the unusual step of offering reiki, an ancient Asian technique, and foot reflexology free of charge to adults and children — as well as acupuncture to adults — in its outpatient infusion clinics during chemotherapy treatments. The hospital soon will start a nearly $2 million project to convert the first floor of one of its buildings into a new center for “integrative therapies,’’ which eventually could double the number of patients it can accommodate. More than 3,000 patients scheduled appointments for acupuncture and massage last year, a 25 percent jump over 2014. A growing body of research supports acupuncture as a treatment for pain and nausea in oncology patients, but few high-quality studies exist on the effectiveness of reflexology and reiki. The investment by Dana-Farber, a leading cancer treatment center, underscores a growing willingness among mainstream medical institutions nationally to offer complementary therapies that appear to help patients — even without definitive proof. It also signals increasing interest in the potential benefits for children and teens. The Children’s Hospital of Philadelphia, for example, will start offering acupuncture to all patients next month, and massage and aromatherapy to cancer patients within a year. Many patients also are burdened with depression, and anxiety that the cancer will return. Ligibel said Dana-Farber will study different therapies and approaches — including whether 15-minute sessions during chemotherapy improve patients’ quality of life — in part to help guide other providers. “Without research it’s hard to know where resources should be devoted,’’ she said. Therapist Maria Barbara Mathay did reflexology on Carlie Gonzalez. To provide reiki, Dana-Farber will train volunteers, many of them cancer survivors themselves. Practitioners place their hands on various parts of a patient’s body, which is believed to transmit positive energy and encourage healing. The technique is controversial, however. MD Anderson Cancer Center in Houston decided against providing reiki or other so-called “energy therapies’’ because of lack of convincing evidence. In one small study published five years ago in the journal Cancer, researchers found little overall difference in depression and anxiety levels for men with prostate cancer who underwent either reiki, “relaxation response therapy,’’ or were put on a wait list — though reiki seemed to have some benefit for men who were anxious to begin with. Ligibel said more research is needed to sort this out. “I struggle with the mechanism of a lot of these therapies, but I’ve seen them work for people,’’ she said. There is broader agreement on the benefits of acupuncture, which involves inserting thin needles into the skin at strategic points on the body. Traditional Chinese medicine holds that it balances energy flow, while Western practitioners believe it stimulates nerves, perhaps releasing natural painkillers. Memorial Sloan-Kettering Cancer Center researchers reviewed results of clinical trials involving 17,922 patients and found, on average, that acupuncture reduced chronic pain by more than 50 percent. That compared to 42 percent for “sham acupuncture’’ and 30 percent for no acupuncture. Smaller studies suggest it improves mood and fatigue and relieves chronic dry mouth after head and neck radiation. Massage looks promising as a way to relax patients and improve their moods, researchers say, though the benefits appear short-lived. And it’s unclear whether adding foot reflexology to the mix increases the benefits. Practitioners believe that pressing spots on the foot that correspond to organs, glands, and other parts of the body can promote deeper relaxation. He recalled a patient in his early 20s, a college football star who had extensive cancer in his bones. He rated his pain as 9 out of 10. A massage therapist was sent to his room to do a light massage. At the end, she asked him his pain level. He said excruciating. She felt bad, but the next day the patient’s nurses paged her to come back. She was surprised and told them it didn’t help. Free and complimentary reflexology therapies are offered to patients while they get chemotherapy at Dana-Farber Cancer Institute. “They said, ‘You don’t understand. During the massage he had no pain,’ ’’ Cohen recalled. “That much relief for that period of time, it’s a priceless gift.’’ Providing these services during chemotherapy, he said, exposes more people to their potential benefits. Mathay, who works four times a week in the outpatient pediatric unit, called the Jimmy Fund Clinic, said 80 percent of the children to whom she provides therapy are repeat clients. On a recent Wednesday morning, Aaron Keville, 10, was in his final week of chemotherapy. Like Carlie, he was diagnosed with Ewing’s sarcoma in the fall, after his dentist discovered a growth under his tongue. Despite losing 20 pounds, Aaron has done well and his family is planning to transfer to an Air Force base near San Francisco this summer. Aaron, who had been treated by Mathay previously, is interested in how reflexology works, and Mathay had brought him a chart of showing the pressure points on the feet and their corresponding organs. During treatment, his eyelids fluttered and Mathay suggested he nap. “Then I won’t be able to feel it,’’ he said.